As many Middletown residents know, the single lane, wood-decked West Street bridge over the Genesee & Wyoming Railroad just west of Washington St., (pictured below) is badly in need of replacement. 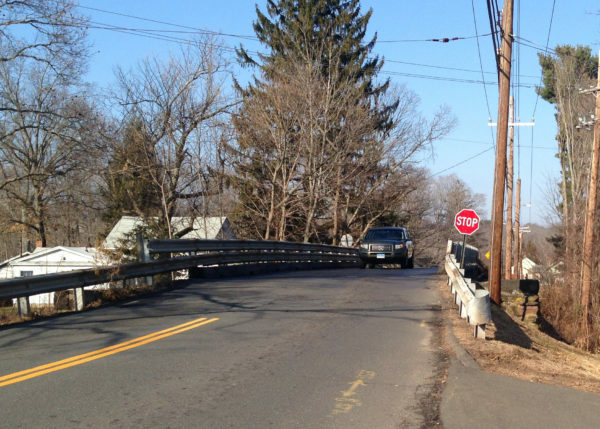 The State of Connecticut Department of Transportation (CT DOT) declared the bridge obsolete at least ten years ago, but plans for replacement were delayed for a variety of reasons. When the Jonah Center and Middletown’s Complete Streets Committee were informed of this project in 2012, we began advocating for a generous (bike trail width) pedestrian and bicycle bridge to be incorporated into the new motor vehicle bridge. Not only is the bridge dangerously narrow for cars, but pedestrians, bicyclists, and wheelchair users frequently cross the bridge, often at great peril. West Street is identified on Middletown’s Complete Streets Master Plan as an important route for bicycles to travel from the south to the north side of Washington Street, and a future multi-use trail is envisioned for the entire length of West Street, from Wadsworth Street to Washington Street. 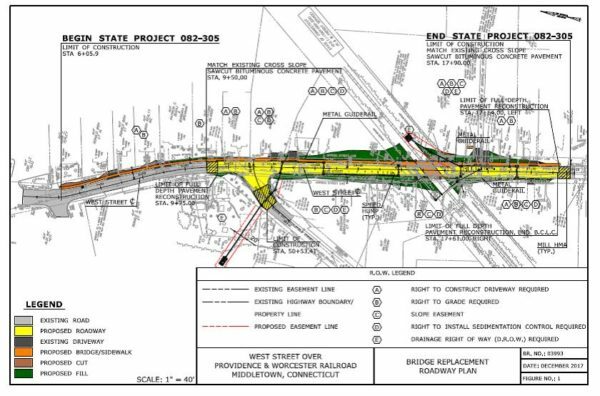 Middletown’s Public Works Department was supportive of our request, and CT DOT readily accepted the suggested addition of a broad pedestrian and bicycle lane on the east side of the bridge. The bridge replacement project will include the reconstruction of approximately 785 feet of approach roadway. In addition, the project proposes to construct a sidewalk on an additional 360 feet of West Street, resulting in a total project length of 1,200 feet. The sidewalk construction proposed as part of this project will provide pedestrian connectivity between Route 66 (Washington Street) and Butternut Street. Proposed roadway improvements include a 28 foot wide curbed approach roadway, a 5.5 foot wide sidewalk on the east side of West Street, traffic calming measures, and drainage improvements. The roadway at the bridge will be 23.5 feet wide with a 10 foot wide sidewalk/path. During construction, West Street will be closed at the bridge and traffic will be detoured via Route 157 to Wadsworth Street.